The Hilltop Hideaway offers amazing craftsmanship and fabulous views. Especially for honeymooners, and those desiring ultimate privacy, the Hilltop Hideaway is perfect for you. 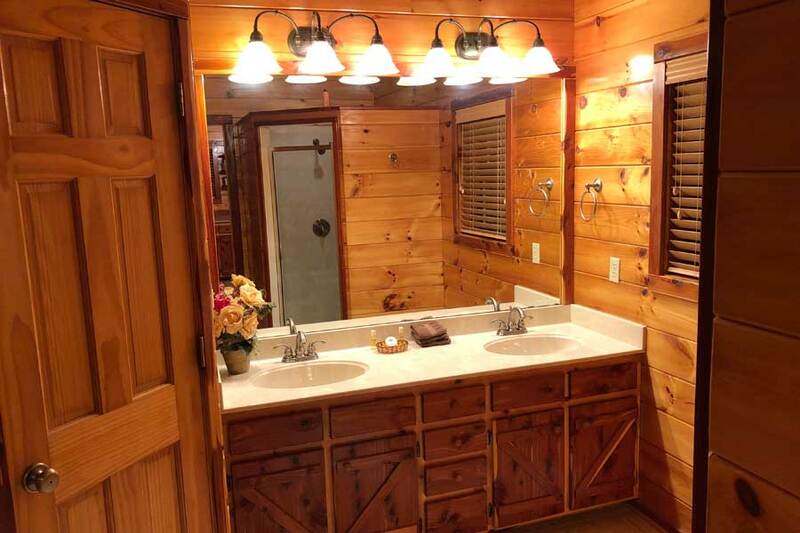 This spacious 850 square foot Eureka Springs cabin has all the right touches – lofted bedroom with a King size bed, TV, private balcony, and a 6 foot round Jacuzzi with picture window to enjoy incredible views of nature. Your living room has all the necessities of modern day life, satellite TV, DVD and stereo, and for those who prefer to relax and unwind by the light of a fire, we have a gas fireplace available in the winter months. Step outside to enjoy breathtaking views from your large private deck. If you prefer to dine-in you may wish to use the charcoal BBQ grill located on your deck. Your kitchen is fully equipped with the added touch of a picture window by your dining table. Finally, the spacious bathroom has a beautiful 4 by 5 marble shower for two and large vanity with double sinks.